Haunting banjo strings, broken photo frames, a fly screen door that won’t quite close: SUDS’ Buried Child is an embodiment of the ‘Southern Grotesque’. Incredibly evocative, the society’s latest production reveals to us the hilarious, heartbreaking and often horrifying aspects of the decaying American Dream. Gabriel Burke directs Sam Shepard's Buried Child (1978): the story of a destitute family living in rural Illinois. Aging couple Dodge and Hallie (Liam Hurley and Akala Newman respectively) bicker constantly, while a shell-shocked Tilden (Jack Walton) and an unpredictable Bradley (Nelson Scott) create an interior of depressing routine. However, the arrival of visitors from New York disrupt this routine, forcing the family to confront their past. Walton shines as half-wit Tilden; what could have been a one-dimensional comedy routine instead develops into an empathetic performance. This is impressive considering the initial absence of context surrounding his mental state. Liam Hurley’s startlingly realistic Dodge, who utterly embodies the stereotypical figure of a wrecked and wasted old man, confronts the audience. Hurley convincingly depicts a disturbing realism of life without meaning or depth, existing to despise any intrusion to his life that would delay the consumption of his all-precious whiskey. Newman’s enthusiastic and babbling Hallie is memorable. She brings a sentimentality and love that is so sorely missing from her life and the play itself; this idea is strongly emphasized by the sheer presence of Nelson Scott as the violent and narcissistic older brother, Bradley. Unfortunately, the process of decoding ‘Buried Child’ is hindered by the actor’s accents. While some have an excellent command of the Southern drawl, other’s accents mar our ability to decipher major plot points. Though Northern characters - namely Vince (Flynn Barnard) and Shelly (Nina Bayndrian) - are perfectly understandable, they lack a subtly in performance. This leaves dialogue that is ripe with possibility delivered in repetitive, monotonous shouting. These are regrettable hiccups that limit Burke’s ability to immerse us in the deep South. In the best possible way, costume is understated. Costume designer Catherine McLauren perfectly captures a world in which people, besides Hallie, do not invest in their appearance. Set designer Chris Wale makes creative and original use of the Cellar space, with a focus on a large living room and outside patio that together accommodate every character’s movements, while subtly commenting on both the lack of escape and inward-looking nature of the family. In an interview, Burke spoke to his desire to draw parallels between the American Dream and the Australian Dream and how, ultimately, neither of these are achievable. Largely, Burke achieves this: transforming the Cellar Theatre into the crumbling embodiment of a national dream. 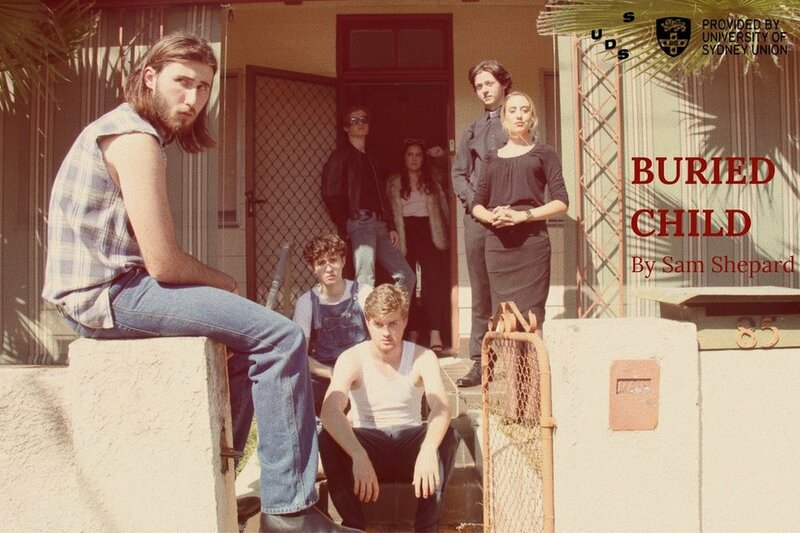 Buried Child runs May 9-12th in the Cellar Theatre, University of Sydney.